Travel Blog 3 — Two 66 year olds in a '66 Thunderbird on Route 66. Two 66 year olds in a '66 Thunderbird on Route 66. We started out early because the cranberry harvesting starts at daylight. We headed out to watch after Joe had a cup of coffee. Nelson and everyone else was already hard at work by the time we got there. The new cranberry beater was interesting to watch in action. We saw the tractor tightened the noose around the floating cranberries so they could be loaded into the truck. After a bit of observing, we said our good byes and left them to it. After loading the car, we headed toward Coos Bay, OR. Nelson gave us the name of a German restaurant that would be good for breakfast. We were thinking about bratwurst, eggs, potatoes and toast. However, when we got there it was only open for lunch and dinner. As I said, we got up very early and were hungry. We did a little sightseeing on the bay walk, filled the car with fuel, got ice for the cooler, and got back to The Blue Heron just as they opened for lunch. By then we were really hungry! We got our bratwurst with German potato salad, a sourdough rye bread, and sauerkraut...no eggs, though. We liked it! Then we took off for South Shore State Park, which was part of the Simpson Estate, a timber family from the 1920s. The gardens have been re-done and are extremely well cared for and manicured. They were beginning their fall trimming of bushes and trees. They have an annual Christmas light display that is a well known holiday destination and they were beginning to put up the lights. On our continued northward travel we stopped at a overlook and elk viewing area near Roseburg, OR. Most of the elk seemed camera shy with the exception of this young male who seemed to enjoy having his picture taken. We went on and discovered a small winery that has the second oldest pinot noir vineyard in Oregon. The vines were planted in 1972. We sampled their wines and purchased a few good bottles to take with us. When we got to I5 we looked at the distance we still had to go to Roseburg, and we changed our minds and our direction toward home. The magnetic pull toward home and family was just a little stronger than the pull to go to Roseburg and have one more day of our trip. We kinda missed everyone! It has been a great adventure! By the time we pulled the T-bird into Joe's driveway, we had been on the road for 37 days, traveled 8,136 miles, and visited 19 states. Besides...there's always next time! 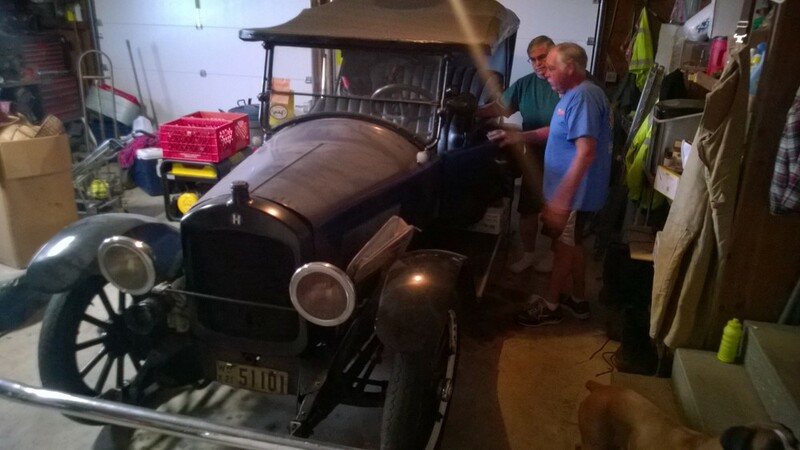 We got up and going this this morning about 8:00 AM, We visited with Martin and he showed us his Hupmobile. He is going to start working on it this winter. What a great project! On the way to Ferndale, CA we stopped by the farthest western point on the west coast in the continuous US. It seemed like a great photo op for the Millennium Bird! The western point looks just like the beach anywhere. The town of Ferndale has a number of older buildings that are fixed up nicely and are pretty impressive. We headed to Eureka, CA to find a muffler shop. As we have traveled we continue to pick up "stuff"; things we want to bring home from our trip. As we do, the car gets lower and closer to the ground. We have been careful going over speed bumps but caught a muffler clamp and broke the bracket. It has been rattling,so we had it fixed. While we waited for the car, we had breakfast and then picked up the car and headed north. Soon we started to see real trees and more redwoods the further north we went. We stopped by the Trees of Mystery to look in the gift shop and we took the Thunderbird through the big redwood tree. It fit but it was close. Then on we went towards Crescent City, CA, As we got closer it started to rain. That was the first rainfall of any quantity for the whole trip! The wipers were on full just to see the road. We got to the Langlois, OR and to the Langlois Market in time to have a famous hot dog and picked up some snacks. Then we went on to Nelsen's and Suzie's house to settle in for the night. 10/19/14 - ...And More Wine! We started off the day by reorganizing and the packing of the car. We have two cases of wine and we think we may purchase more today. As we headed north we watched for interesting things to stop and see. We spotted some outside structures from the road and took the next exit to take a look. It turns out the town had put them up to attract tourists and it worked on us, so maybe it works on others, too. We drove through town looking right and left form more. At the end (the real beginning) of town we picked up a brochure that explained everything. Our first winery of the day was Fritz, an underground winery that has an underground tasting room. The whole winery is built into the hill with the crushing of grapes done on the top. Everything else goes down after that; all gravity feed. The wines we tasted were good and of course, some we liked better then others. They had a late harvest zin that went very well with chocolate! We made our purchases and continued on our trek. The next stop on the way was a Starbucks for ice tea to go and to use there rest room. We found the Starbucks while looking for the largest red wood service station. It was made out of one tree section. The restrooms were in a smaller section. Luckily, we found the Starbucks and it was open. The station is a museum and it was closed. Our next winery was Parducci; a small winery that I had visited while still in college. Since then hey have upgraded there tasting room (It was, after all, a long time ago!) and there wines are still good. The young woman behind the counter ask if we had been here before, and I got to use my geezer response, "Long before you were born, Honey." She replied that that was not that long ago in the realm of wine, and that she had been to a tasting in which 2 of the 4 wines tasted were older then she was. We tasted, purchased wine along with some crackers and salami to go with the cheese that Joe had purchased the day before. Our clocks told us we had managed to go only 60 miles in 4 hours. It was time to pick up the pace. The roads we took into the redwoods were older and were built for older cars that drove at shower speeds. The trees had not gotten smaller and the road was not straight at all. We continued on to Ferndale, CA, the most western city in the continental US. This small town was were they filmed The Majestic, a movie about saving a movie theatre. The downtown area is well kept up and is very attractive. Tomorrow, we'll be back in Oregon territory. We started our morning at a nearby service station, as per our usual after getting-ready routine. We make the usual check of the oil and add some if needed, check the coolant, trans fluid and the air in the tires andtheb fill up with fuel. As we were putting a little extra air in the rear tires, a fellow stopped by to look at the car and talk about JDRF. He has Type 1 and was diagnosed at 17. He told us about some of his experiences growing up and gave us a donation. He is a "car guy" and was glad that some one was linking cars and JDRF to. We thanked him for the donation, gave him one of our cards and headed out for wine country. 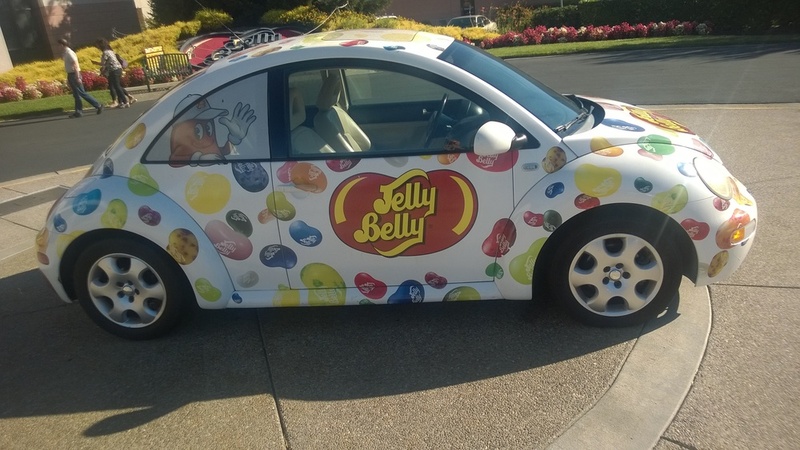 On the way we stopped by the Jelly Belly Factory. I had forgotten that this was Saturday, but after seeing kids everywhere I came back to the reality that we would not be the only ones on the tour. We did our part to help the economy in the gift shop and moved on. Wine country on the weekend is pretty close to grid lock. We headed to the back side of the valley to get away from the larger groups and the buses, limos and the wine train. A number of the smaller wineries were closed for private party's ( weddings), so we ventured into known brands. I had read that some of the wineries were charging a none refundable fee to taste there wines. The highest fee we found was $50.00. We should have figured this out when we drove in and the parking valets were all anxious to park the Thunderbird. We chose to self park on the other side of the lot. After all, we didn't want to out class the Porsche's and BMW's with the Millennium Bird by parking on the valet side next to them. After traveling north for a while, we veered back to the wild side of the valley. Things were much calmer up towards Calistoga. We stopped by V. Sattvi winery. This one has a big picnic area. They were doing a BBQ and had a deli that sold cheese, salads and sandwich's. Joe found some great cheese and crackers that we snacked on while tasting wine. We ended up purchasing a case between us. We saved 10% for buying in quantity, That sounds like someone I know. She saves money by purchasing the complete outfit instead of just the blouse that she needed (I heard that, Jim.). We continued tasting and watching people until about 4:00 and then headed for Santa Rosa; our stop for the night. We totaled 130 miles today, This is the first travel day that we spent more on food, not wine, then we spent on fuel. Dinner was on 4th street in downtown at an outside table where we continued people watching. We arrived in Lone Pine, CA in the dark last night and did not realize that we were in a valley. We noticed that as we were walking to breakfast. Another surprise was the Raccoon foot prints on the T-bird. Raccoon foot prints in the dust on the car. We learned that the Lone Pine area is the backdrop for numerous movies, from Gunga Din, Gone in 30 Seconds, to the desert scenes in Iron man. How did we find out this information? We stopped by the Lone Pine Film History Museum. It is closed at this time of year except for weekends, so we studied the mural on the wall and the posters in the windows. The signed photos in the café where we ate breakfast gave us other clues. We started out heading north towards Reno on Highway 395. Our starting elevation was 3,720 feet. The first Summit was 7,000 feet. We felt that we were on a very big Roller Coaster because the summits that followed were 8,013 feet, followed by 8,345 feet. They were each followed by drops to about 3,500 feet. These were not straight roads either! We managed to make it to State Line. NV for lunch at about 3 PM. The Thunderbird did great! There were no major problems but at the 8,300 foot elevation the amount of power available in reserve was minimal. Luckily, we didn't need auxiliary power ( Joe pushing) to make it over the hill. We checked out the schedules for the shows in State Line. We were not interested in Styx or The Black Keys, so we checked our maps and decided to beat the rush for wine and head to Vacaville, CA; a good place for jellybeans and wine. This was one of our longest days in the car. We left Lone Pine at 9:00 AM and drove until 6:30 PM. There wasn't really any place to stop. We didn't even have cell phone service for a good part of the trip. At 8,000 feet elevation the cell phone towers were all below us. It is beautiful up there! Joe said "There is a lot of nothing out there, and some places have more nothing than others." Even though we drove 450 miles in the car, it was still comfortable. It is a cruiser for distance and speed, and we have had plenty of miles to test that theory daily. A travelog of two 66 year old car guys driving Rt 66, in a '66 Thunderbird completing a bucket list item, and raising money for diabetes research. Help turn type One Diabetes into Type None! For more information about JDRF, please visit www.oregon.jdrf.org.